42 year old male who had a prior traumatic injury resulting in drooping of the right upper eyelid. He underwent repair of the eyelid muscle and removal of skin, resulting in more even symmetry between his upper eyelids. 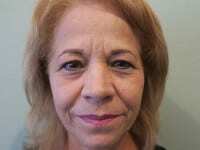 62 year old female who underwent an upper blepharoplasty for removal of excess skin.